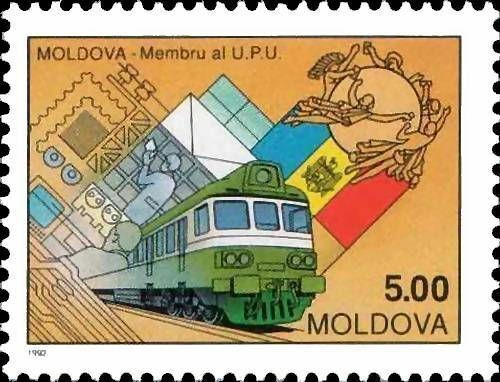 On 26 December 1992, the Post Office of Moldova (Poșta Moldovei) issued a series of postage stamps with the title Moldovan Membership of the Universal Postal Union (UPU). The issue comprises two stamps, with associated cancellation (postmark) and first day cover (FDC). The designer was Pal Varaga. 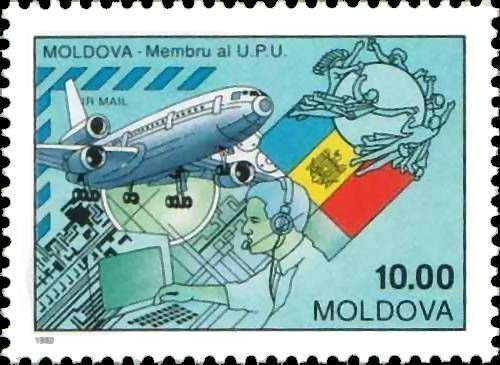 The printing was performed by Bulgarian State Printers, Sofia. The Universal Postal Union (UPU, French: Union postale universelle) is a specialized agency of the United Nations that coordinates postal policies among member nations, in addition to the worldwide postal system. The UPU contains four bodies consisting of the Congress, the Council of Administration (CA), the Postal Operations Council (POC) and the International Bureau (IB). It also oversees two cooperatives including the Telematics and EMS Cooperatives respectively. Each member agrees to the same terms for conducting international postal duties. The UPU’s headquarters are located in Bern, Switzerland. French is the official language of the UPU. English was added as a working language in 1994. The majority of the UPU's documents and publications – including its flagship magazine, Union Postale - are available in the United Nations' official languages. Read more.. This article uses material from the Wikipedia article 'Universal_Postal_Union', which is released under the Creative Commons Attribution-Share-Alike License 3.0.